In a large bowl, mix the flour, salt, sugar and butter. Rub the fat into the flour. Make sure that you don’t work the mixture for longer than 5 minutes or the butter will become too soft in contact with your fingers. This can also be done in a food mixer: stop before the mixture binds together and becomes a dough. Mix in the egg to obtain a smooth dough. If you’re using a food mixer, this will take 30 seconds. Shape the dough into a ball, place it between tow sheets of floured baking parchment and roll it out with a rolling pin to a thickness of 5 or 6 mm. Place it on a baking sheet, still within the sheets of baking parchment, and refrigerate for an hour. The dough will be firm after an hour and easier to cut. 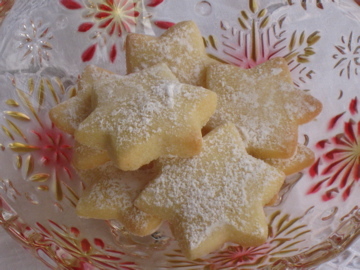 Remove the baking parchment and cut different shapes, such as stars, moons or hearts. Place the biscuits on a baking sheet lined with fresh baking parchment and bake for 15 to 20 minutes. Leave to cool, then sprinkle with icing sugar . In a bowl, mix 20g of egg white with 60g icing sugar, whisk it briskly with a fork. Then simply coat each biscuit with a brushful of the icing mixture.